Not to stereotype tech folks, but, I’ll do it anyways. Most of us could stand to get in better physical shape. I know, that’s about as surprising as a cryptocurrency crash. In particular, I highly recommend a weight training program. If you’re in the Bellevue, WA area, I have just the gym for you, Impact Strength and Performance. But first, let me make the case by sharing my experiences for the past two years. 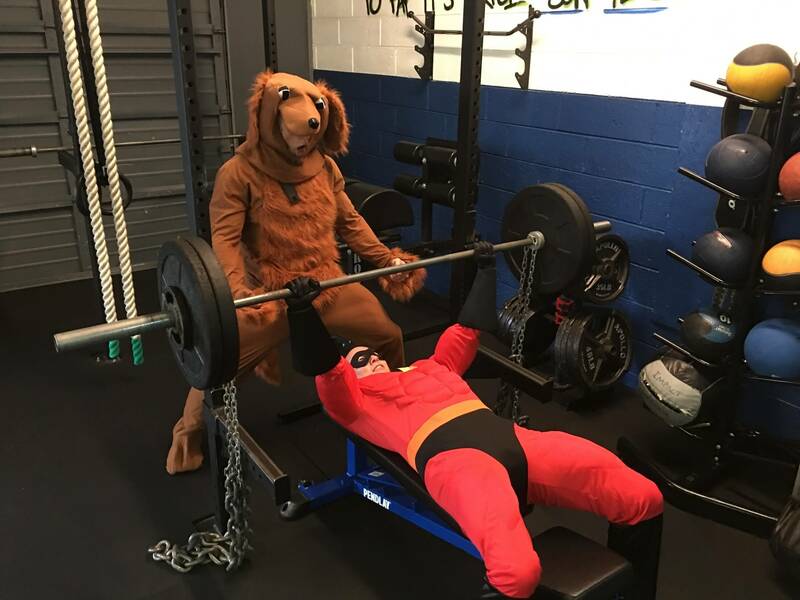 As you can see from the photo, I’ve gotten quite swole (note: costume muscles will NOT help you lift more weights). You’re a high achiever. You’re busy hustling to make a dent in the world. And the tiny morsels of time left over after work go to your family. I get it. For me, it wasn’t just an issue of not having time. It was really hard to simply overcome inertia. This is where the motivational words of the leading philosopher of our time, Shia LeBeouf, really resonate - Just do it! In my case, my wife signed us up for a painfully early fitness class (it really helps to have a partner!) two years ago. Rather than hem and haw, we just forced ourselves to show up. That’s often the hardest part. Get out of bed, and go. Once you’re there, it gets better. Over time, it became a habit. That’s your goal really. Turn it from a chore to a habit. I realized that working out wasn’t just for my own benefit, it’s for my family. I want to model healthy behavior to my kids so they too will be healthy. But more than that, I asked myself why am I working so hard in the first place? What benefit is all the money in the world if I’m unhealthy and weak? If I’m not strong enough to play with my kids or, down the road, my future grandkids? This is why I make time for the gym at the cost of a few less emails answered for work. If you’re not convinced, here are 13 more reasons to start lifting weights. And if you’re one who supports people with mental illness, you need support too. Support can come in many forms. For me this summer, it came in the form of lifting. As I supported my family, I tended to my own mental and physical well being by increasing how often I went to the gym. I started to go every day of the week except Sunday (when it’s closed). When I returned to work, I had to cut back a bit, though I’m trying hard to organize my schedule so I can get back to every day. The progress I made in that time wasn’t just physical. My mental well being improved a lot too. Having a clear objective for working out and setting specific goals towards that objective is an important part of any fitness program. It provides focus and motivation. At the beginning of the year, I set three specific and measurable fitness goals for myself to accomplish by the end of the year. Do a push-up with my son on my back. Touch my toes without bending my knees. I’m happy to report that I accomplished two out of three of my goals. The first one was particularly challenging because my son is 10 and he’s growing fast. I didn’t anticipate how much heavier he’d be at the end of the year. The goal I didn’t accomplish is touching my toes. I’m about as flexible as a gymnast in a full-body cast. Impact also has an InBody scanning machine so I can track my quantitative progress. It’s important to not put too much stock in any individual measurement. Especially the ones you don’t like. It’s more important to look at the overall trend. You can see there’s one measurement I’m skeptical of in the screenshot below. I’m pretty sure I took that one at night rather than in the morning like all the others. Perhaps for the first time in my life, I’m seeing steady gains. But I’m not into that BRO culture. I know, they’re meant to be funny, but they do reflect in some tiny way the culture around Crossfit. It’s great for a lot of people, just not me. Their newest hoodies tweak the slogan. Work hard and love yourself. This just fits my own personal style very well. In the show Cheers, the patrons show up every day because they love being in a place where everyone knows their name. I feel a lot like this at Impact. I love going because I know I’m going to not only get a good workout, but I’ll see people I genuinely like and have great conversations. 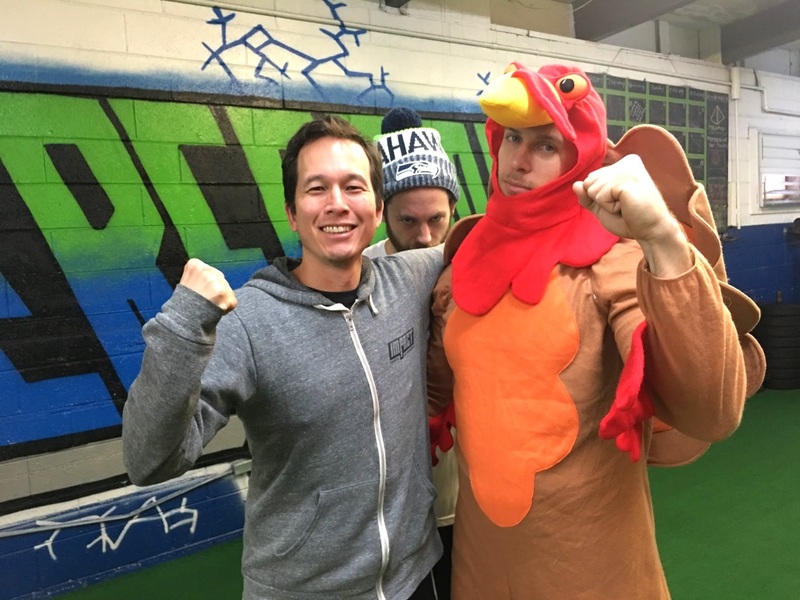 Impact is a small private gym owned by Drew Ragan (the Turkey). I’ll admit, when I first met him, I thought he was another stereotype of a gym rat swole bro. I couldn’t have been more wrong. He’s extremely knowledgeable, caring, and intelligent. I call him the “Philosopher Bro” as it’s just as easy to get into a conversation with him about eastern philosophy as a discussion about proprioception. Riley (the photo bomber) is the other main coach and he’s inquisitive, hilarious, knowledgeable, and kind. Together, they’ve created an environment that’s friendly, fun, and just a bit wacky (as evidenced by the photos). As kind and caring as they are, they will push you to give your best. You get out what you put in and their approach gets results. And don’t worry, Drew doesn’t wear a costume to every workout. I just happened to have photos from Halloween and Thanksgiving when he did. One of my favorite things about the gym is they contribute back to the local community. Every Saturday they have a “Go-Giver” workout that members and non-members can attend for $10. All proceeds go to a local charity chosen by the members of the month. I even got my skinny friend Noah to come out one time. 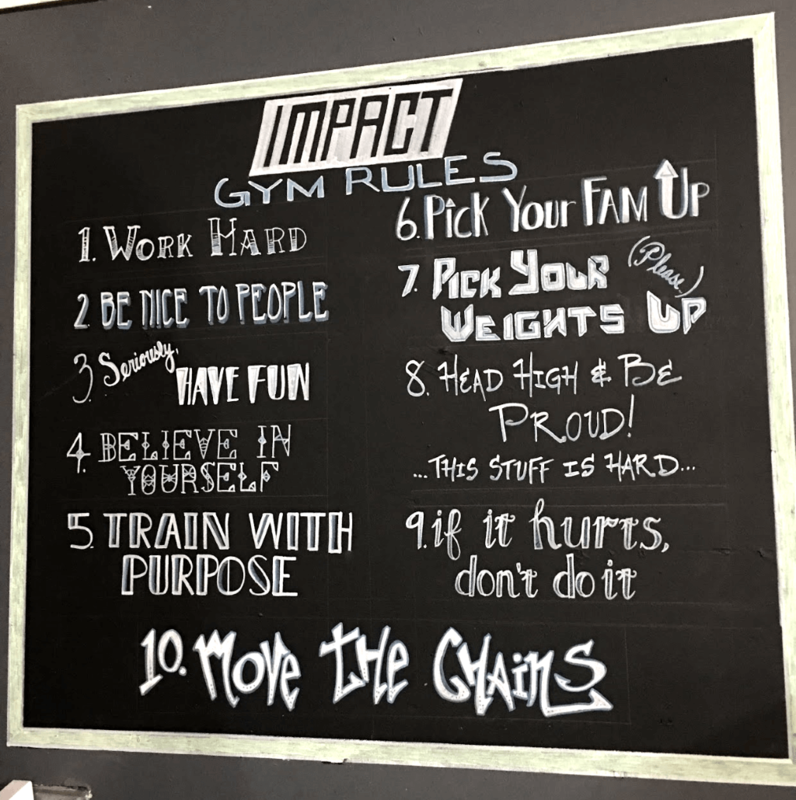 If you don’t live in the area, I encourage you to find a gym like Impact. If you do live in the area, give Impact a try. Your first workout is free. Just tell them Phil sent you. If you want to go when I’m there, DM me on Twitter and I’ll tell you when I’ll be there next. This is a great way to start the new year on the right foot. You won’t regret it! That's some decent weight you're benching, nice.